The hunt for great pizza has become a borderline obsession for me over the last few years. This has driven me to learn about the art of pizza making and grow my appreciation for the different versions that exist across the country. Most people stick with whatever is the prevalent variety of their area from the famous New York thin crust or Chicago deep dish styles to the thick crust, sweet sauce, heavily cheesed style of pizza that I would consider to be Western New York style. My personal favorite is Neopolitan; one that doesn’t have a regional home in America and is what I consider the simplest and most pure form of pizza. Fiamma Pizza e Vino located on Buffalo Road in Gates puts out my favorite pies in Rochester and one of the best Neopolitan style pizzas I’ve had anywhere. 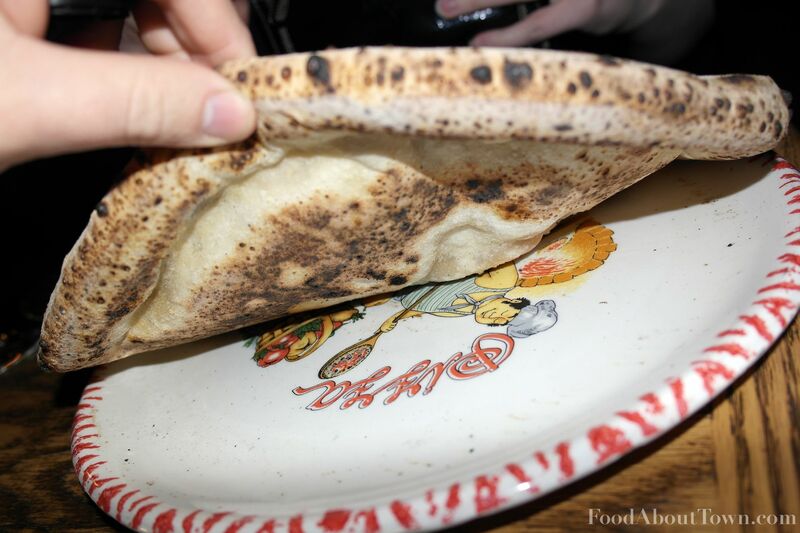 Before I dive into the specifics about Fiamma, I’d like to give a quick primer on Neopolitan style pizza for those that aren’t familiar. I’m not an expert, but have become familiar with the style after sampling it in a number of different locations and also spending time making and baking the dough at home. Typically the crust is thin and cooked very quickly (under 90 seconds is preferred) in a 900°F+ wood fired oven and served somewhere in the 10-12” diameter range. The resulting pizza is not as crispy as a NY style pie and usually topped in a minimalist fashion with the most traditional being only crushed tomatoes, fresh mozzarella cheese and basil. That was just short description, so if you’d like to read more on the topic please check out Adam Kuban’s article on Serious Eats – Slice where he breaks down the style in more detail. Adam doesn’t work there anymore, but he is an engaging writer and still one of the biggest boosters of pizza in the food world. It is well worth reading that article and his other work if you get a chance. I do have to mention that since I made my first visit a little over a year ago, I have become friends with the owner and head pizzaiolo (pizza maker) Giuseppe Paciullo. In addition, I’ve spent some time hanging out with him near the Marra Forni oven and helping to make pizzas. I will be making my best effort to maintain my objectivity, but in the spirit of transparency I thought it important to mention before talking about the food. My main focus for this review will be on the pizza and I’ll leave my thoughts on the remainder of their menu for another time. I established a format for my pizza reviews a while back and this will be no exception. A bit more detail than most since I have been there so many times, but the same format focusing on the crust and toppings separately and then a recap of my thoughts. The crust is my main focus when I try out new pizzerias and Fiamma’s is best defined as being Neopolitan style and what I would consider to be a fine version of it. The pizzas are cooked in the wood fired oven with a mix of hardwoods at 900°-1000° which allows the crust to gain features that only come with cooking at high temperatures. The dough is made daily with Caputo 00 Blue flour, water, yeast and salt. Simple ingredients, but great results. The undercarriage and the cornicione (outer crust) of the pies get a solid amount of leopard spot char that adds to the overall flavor without being overpowering. I’m a fan of char as long as it doesn’t pass the line between charred and burned since it offers some bitterness and adds some textural and visual pop. A puffy, chewy and just slightly crispy cornicione matches up with the extra thin and slightly soft middle portion that droops when cut into slices. I also love the fact that their dough has developed flavor from the yeast and enough salt to be delicious with or without toppings. For any other pizza travelers like myself, the seasoning of the dough is at about the same level as Una Pizza Napoletana in San Francisco which is also one of my favorites. It lets the toppings speak for themselves and makes it so you don’t have to add any salt to pies that don’t have salty ingredients. Addictive flavor and I’d just eat it as bread if it wasn’t made into pizza. In fact, the dough is used for their sandwiches, foccacia and even dessert pizza. Something else that should be noted is the consistency of the pizzas that come out of the oven. As you look at the pictures you can see the trademark leopard spotting and I can attest to the fact that almost every pie I’ve had at Fiamma has looked similar. That is a sign of an experienced pizzaiolo at work and something that is very valuable when the difference between perfection and disaster is a matter of seconds. In general, the style of topping pies at Fiamma falls more toward the simplistic Neopolitan side of things with mostly a good balance between favors. I’ve had the pleasure of sampling just about every pizza on the menu and although the entire spread is successful, I have a few that I consider to be my favorites. I’ll start off with the Margherita which is not only my favorite pizza at Fiamma, but my favorite individual food in Rochester. Crushed San Marzano tomatoes, fresh mozzarella, basil leaves are the base and then olive oil and gran cru cheese are sprinkled on top to finish. It is an exercise in restraint that allows the sweetness of the tomatoes, the creaminess of the cheese and the anise finish of the basil to shine through and complement the salty crust perfectly. 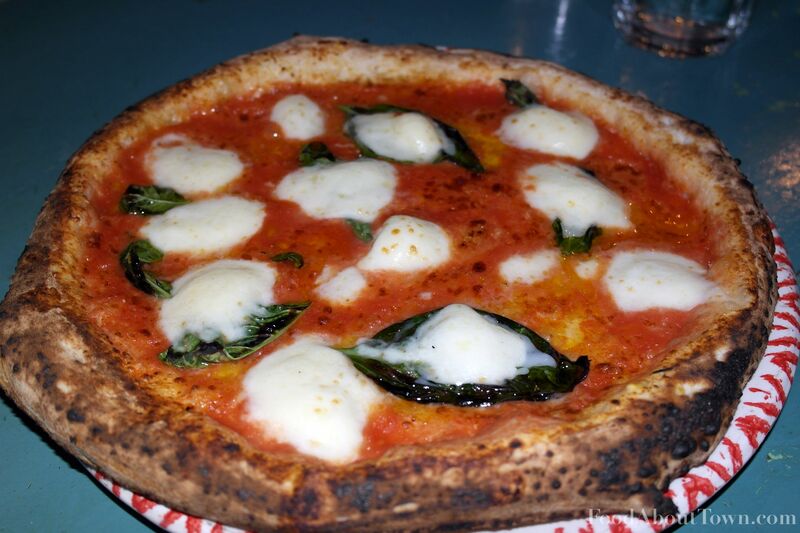 Since there are so few ingredients, each one has to be spot on and that is why I use the Margherita as a benchmark to measure how good a wood fired pizzeria is. If it is your first visit to Fiamma, I would strongly recommend starting your experience with the Margherita and then move on from there. 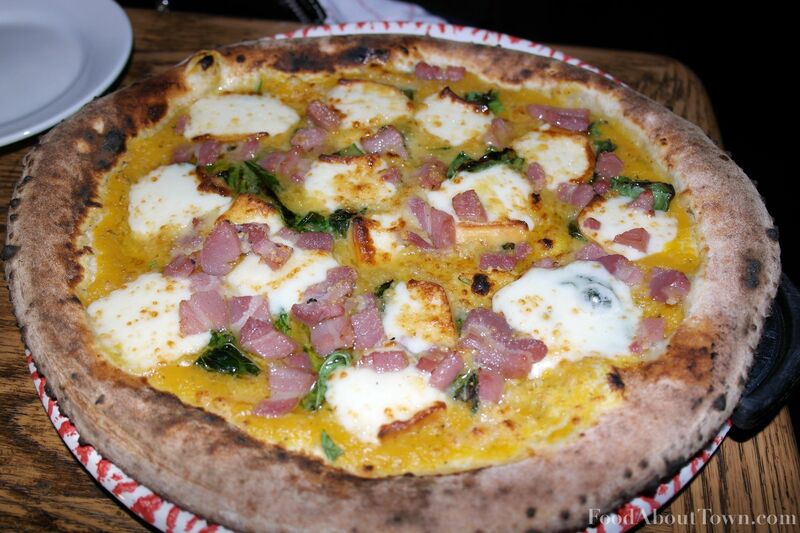 The Positano offers a more unique set of toppings with pureed butternut squash, smoked mozzarella and pancetta that also ends up very balanced. The squash is a fair bit sweeter than the crushed tomatoes, but with the smoke from the cheese echoing the char from the crust and the extra salt and fat from the pancetta works to even things out. In a slightly different direction, the same crust is used to make the Salernitano sandwich that features Italian sausage, broccoli rabe and fresh mozz stuffed inside the rolled over dough. Sure it ends up a bit on the salty side, but the bitter rabe does a good job complementing the fatty sausage and the copious amount of juices that come from the ingredients gets absorbed by the crust leading to some great eating. That isn’t the end of the positives I could say about the topping combinations, but I wanted to toss out some constructive criticism as well so I don’t present a one sided look at the pies. The Capricciosa overwhelms with the amount of toppings (parma cotto ham, mushrooms and olives along with sauce and mozz) on the thin middle portion of the crust and makes it so it can’t really be eaten by hand. 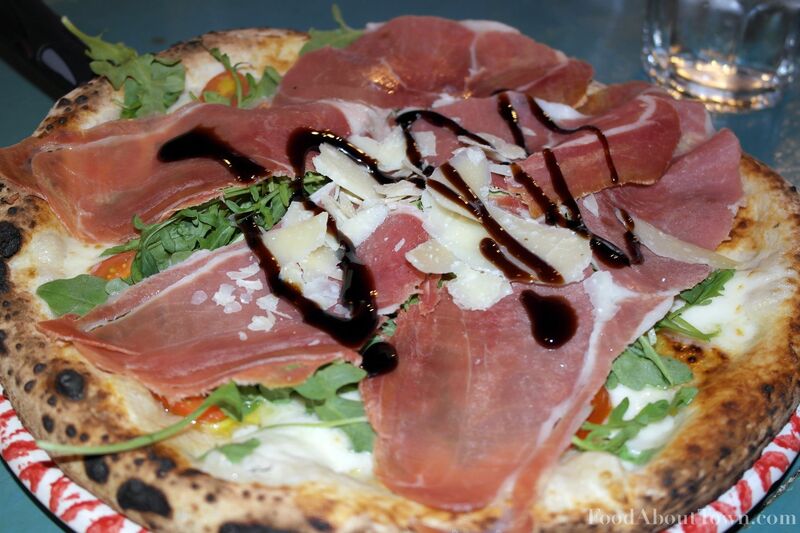 Although I like the San Daniele, the prosciutto is a cut on the thick side for my taste and I’d like to see it placed under the arugula to allow it to soften from the heat of the pizza. The balsamic cream (reduction basically) on the same pizza should be more on the tangy side than the sweet side. The quattro formaggi ends up on the heavy side texturally with the four different cheeses making a large gooey mass in the middle and the gorgonzola dominates the flavor profile to the detriment of the rest of the gang. I think great pizza is an art-form and pizzaiolo Giuseppe Paciullo is a true artist at work. 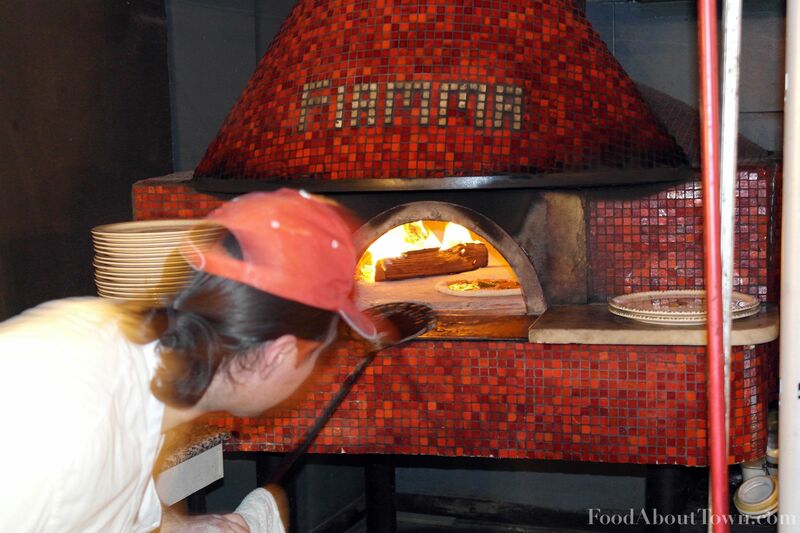 Fiamma offers Neopolitan style pizza to the Rochester area; a product that is unique in town and one that should be celebrated as being something special among the hordes of other pizzerias. I’ve made it my mission to have people give their pies a chance and taste the difference for themselves. I highly recommend making the trip to Gates and experience true passion at work. You won’t be sorry you did! nice writeup. i love this place. its kind of weird that it replaced general hoock’s in that location, which was also great but totally opposite in atmosphere and food philosophy. Thanks Ron! I never had the chance to try Capt Hoock’s before Fiamma came in. What was the style there? But I hear you don’t like the Regina Margherita! What’s up with that? I wouldn’t say I don’t like it RPG, but I prefer the simplicity of the standard Margherita over the Regina. Also, it’s hard to have great fresh tomatoes year round which can cause the overall experience on the Regina to vary. Still a solid pizza, but not my favorite. Love the Buffalo Mozz though!